Now that daylily time is over (it only lasts about a week or two), I have noticed all the dandelions popping up everywhere. That's awesome! Free food! God bless America! A Few years ago, the owner of a florist turned me on to dandelion kimchi. 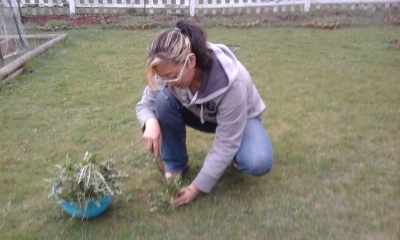 I was wary (as usual) and asked where the dandelions came from, and will I truly not die if I eat them? The kimchi tasted AWESOME. For those of you who don't know, Kimchi is a very spicy pickled condiment that is the staple of Korean food. My father has drilled this into my mind since I was a wee babe. He insisted Kimchi could cure all sorts of ailments, and spark wars and feuds. Growing up in America, I always gave a good eyeroll and grumbled about my father's blind nationalism for Kimchi. that there is a grain of truth in what he's said. It is one of the top ten most healthy foods of the entire world. and make sure to pick ones that did NOT flower already. I took mental note. I have known others to use dandelion greens in salads, and the repeated counsel is to eat them before they allow a flower to bloom, as it will get bitter beyond that point. Last year, I thought I'd try this venture, myself. I asked my friend Ben if he could take out some dandelions from my yard while I was at work. 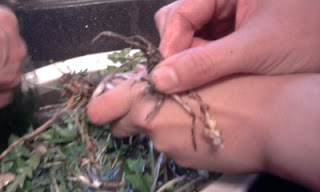 I wasn't expecting much, but when I came home, I was surprised to find his hands black, and a bag full of dandelions. Rockin'! I cleaned them at my parent's house and had them make the kimchi. It was not the same as the florist's, but still had a similar flavor which I could only affirm was the dandelion. Mmmmm so goooood with rice. 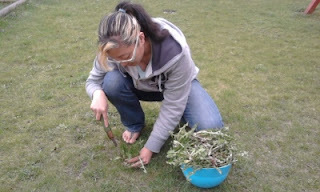 So this year, I armed myself with the taproot/dandelion/weedpuller device, and set to work in the backyard after a good rainfall. 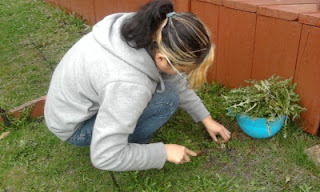 FYI, friends, taking anything out of the soil is a thousand times easier after the rain. Got some over here (my daughter was the camera woman. I insist on doing all these things while the kids play in the backyard. That way I can be an adult presence while they play, or indirectly they can help or observe... but they will grow up being around these activities). so I felt it was safe to partake of this proximity, but they were smaller so I gave up quickly. 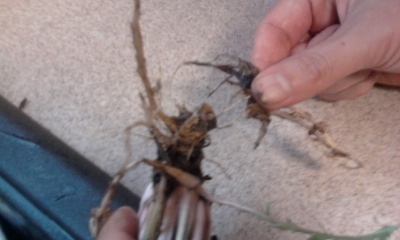 I am removing some small and dried out looking leaves by the taproot. Here it is a little clearer. So all in all, I've got three grocery bags full of dandelions washed a few times, and cleaned. I will give them a final rinse tomorrow at my parent's house. They have giant steel tubs made solely for kimchi making. They even have a refrigerator solely for kimchi making. Therefore, I will document the process and let you know how my family's super not-so-secret kimchi recipe is adjusted to make DANDELION KIMCHI. These times spent with my parents learning their recipes are the treasures I hope to receive as an inheritance. Labels: chicago, Chicago dandelions, dandelion kimchi, dandelion recipe, dandelions, what can I make with dandelions? Eating Day lilies aaaand How I cook it.